How have different mathematicians and physicists dealt with the idea of Infinity? Ever heard of Aleph-nought or the Hilbert’s Hotel and your inquisition got the better of you? Then probably you’re acquainted with infinity and have raised certain perplexing questions about it in classrooms or on math discussions forums. For example, how can you enclose infinity? Can the infinity find the ‘finitude’ somewhere? If yes, then, would not that be against its glory? Because doing so would be a joke with the fundamental concept of “infinity”. Or, have we been defining infinity the wrong way all along? Of the extremely enigmatic mathematical problems that have not been solved until now, the hope is there for some. Fermat’s last theorem for example, remained unsolved for three and a half centuries. Andrew Wiles was able to solve it circa 1994. We also have the ‘continuum hypothesis‘, a problem which cannot be solved with available methods that we currently have. Then is the age-old ‘trisection problem‘ i.e. can we trisect a given angle by using just a ruler and a compass (like Euclid did, in his Elements)? The Hellenic people were deeply mystified about how to make such a trisection, and not surprisingly, in the nineteenth century it was proved impossible—yes! Impossible it was with a mere ruler and compass (ref: Galois Theory). Now let us consider Zeno’s Paradox. Zeno of Elea is said to have been the son of Teleutagorus, a forerunner of Socrates, and a disciple of Parmenides. His work could not survive; however, according to Proclus, his one book that he wrote before visiting Athens had forty paradoxes about continuum. According to some narratives, he is considered to be the defender of his mentor, Paramenides, who said some counter-intuitive and tedious things. And in doing so, he concocted (rather devised) some paradoxes that stirred never ending debates and tussles. There is no motion because that which is moved must arrive at the middle of its course before it arrives at the end. Zeno’s argument is based upon two principles i.e. Infinite Divisibility Principle and the Infinite Sum Principle. In reviewing it using our mathematical approach, it can be said that he gave riveting reasoning for the first, but does not even mention the second. Utilizing them, a conclusion can be made that ‘every magnitude is infinitely large’. This argument is valid, but ‘shaky’, for the Infinite Sum Principle is false. Infinite Sum Principle can be fixed by restricting it to infinite sets with smallest elements. The amended principle is true, and so the resulting argument’s premises would both be true. But this amended argument is invalid. For the revised principle requires that there be smallest parts, and the Infinite Divisibility Principle does not guarantee that there are such parts—it allows the parts to get smaller and smaller, ad infinitum. We can make Zeno’s argument valid, but then one of its premises is false. Or we can make both of its premises true, but then it is invalid. Either way, Zeno’s argument is wobbly and shaky. Take an example of a marathon runner. If he were to run an infinite distance in constant time for each sub-interval, in that sense and case there would have been enough ‘infinite’ time (for that infinite distance). It further unfurls that if finite distance is infinitely divisible, why should not the time be infinitely divisible (and this is discerned nowhere in paradox). Was Zeno talking about physical infinity or some metaphysical infinity? What if you keep dividing your paper sheet into half and half and half and so on? The page remains a page and will never convert into some infinite sheet! Why not the infinite series’ that converge are a perfectly valid explanation? Is there any inconsistency involved in it? Some say you are considering convergent sums and the finitude, so no paradox here. 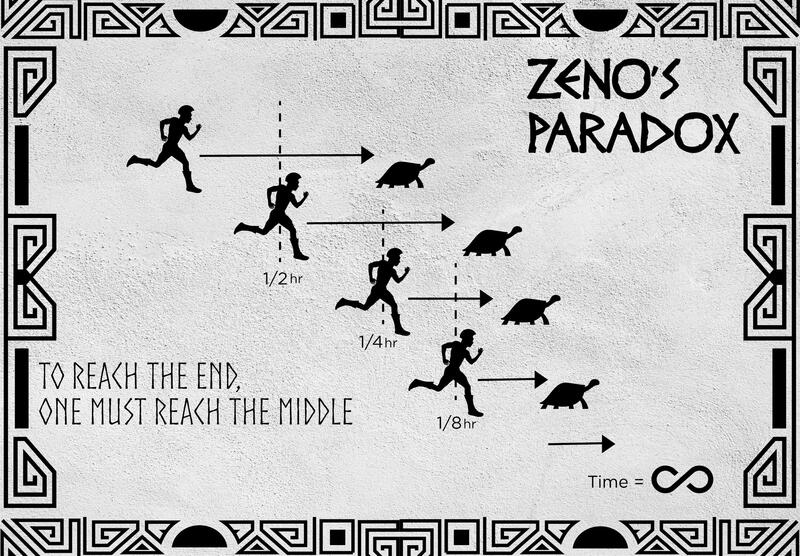 Some would say Zeno proved the motion was impossible. Some would arrive with allegation, ‘he was unaware of ‘theory of limits’’. But some still discuss it as a paradox and a balmy topic, too, because Aristotle did not debunk it wholly (rather called them ‘fallacies’). Pragmatically speaking, in the tone of a physicist, if this division process goes on till an order of a quantum scale or ‘Planck’s distance’, it would not be viable to go on anymore because of the un-cogency of classical geometry. Broadening our horizons and continuing proliferation, let’s put aside math and plunge into physics! Bringing forth the Tenseless Theory of Time (TTT) may seem quite un-instinctual, for it favours determinism and notions of predestination. Our 3-tense-pronged theory of time is dizzying. What did Einstein say in special relativity? What if Betelgeuse dies in some supernova explosion “today”? Such catastrophic event is buried 640 years in the past (being 640 light-years away from Earth) for those extra-terrestrials close to Betelgeuse —The relativity of simultaneity! Zeno probably denied the motion continuity because of being from such School of Thought where ‘one universe—no change, no motion’ was indoctrinated. And yet the QFT (Quantum Field Theory) has its own set of terminologies, that of ‘unitarity’ and ‘locality’. Both of them negate or are at odds with ‘existent or identity law’ (i.e. an existent is always what it is). The ‘locality’ suffers the same trouble as the Zeno’s Paradox, but existence says that limits (or bounds) are defined and so no-thing is impossible in journeying from a point to another even when the distance reduces to Planck’s length (1.6 x 10-35 m) or of its order (by dividing it continuously, what Zeno does). Likewise, ‘unitarity’ comes face to face with ‘existence concept’ which can be explained in quantum probabilistic lexicon, but that is another discussion for other time. Any Feynman admirer like me would opine: “The ‘paradox’ is only a conflict between reality and your feeling of what reality ought to be.” The solutions to paradoxes lie in evincing the fallacy in either the principal assumption or the intermediary conclusions/lemmas. That is why everyone comes with their own solutions, which then become the driving force for paradoxes to perpetuate. Utterly discombobulated by the Paradox, readers are suggested to give a read to the book, ‘The Universal Book of Mathematics: From Abracadabra to Zeno’s Paradoxes’ by David Darling. He has touched newly born Astro-biology as well as the Astronomy, General Science, spaceflight with special, and lucid expositions of Quantum conundrum with its metaphysical and philosophical implications. But the main point is that till now, after 2500 years, there is no agreement that those Paradoxes are resolved in mathematics. We should now prepare ourselves for these contretemps between the mathematicians and the physicists because they would always be squabbling over it and these paradoxes now can only be used in jokes or the allusions to foregoing philosophers. So no verdicts here please, rather establishing a rapport with these furors is endorsed. That was really something, it’s a big, big universe. Okay, gonna give the book a read, seems very interesting.